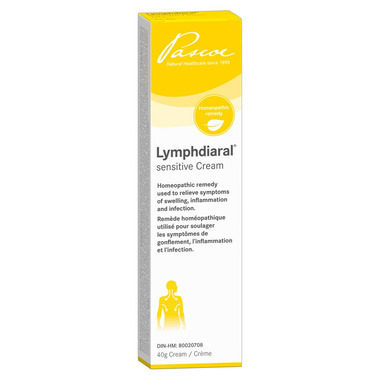 Pascoe Lymphdiaral Sensitive Cream is a homeopathic remedy used to relieve symptoms of swelling, inflammation and infection, such as pain, fever, swollen lymph nodes due to injury or recurrent conditions such as earaches, tonsillitis, and sinusitis. Directions: Adults and children (2-12 years old): Apply the cream sparingly one to three times daily, first in the lymph node drainage area (neck, groin), then in the area where you are experiencing symptoms. Caution: Cetostearyl alcohol may cause local skin irritation (e.g. contact dermatitis). Consult health care practitioner before using in pregnancy or breastfeeding. In the absence of adequate experiential documentation, this homeopathic remedy should not be used in children under 2 years of age. Love this product when we have a sore throat/cold to help drain the swollen nodes in the neck. Easy to apply and not sticky!